- Who wrote the book? - Where was it written? This is a great reference for ages 12 and up. Easy-to-understand text for young people and for people with no Bible background, yet clear and scholarly enough for college students and seminarians. Wall chart: 19" x 26." Pamphlet is great for students. Fits inside a Bible cover: 8.5" x 5.5" and unfolds to 33" long. 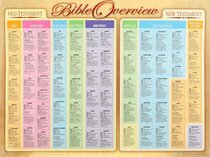 About "Wall Chart: Bible Overview (Laminated)"